In stock - low quantity. Order in the next 3 hours, 13 minutes and it will go out today! Rather than us doing the explaining here, we thought we'd leave it to the creator himself, Martin Lewis. 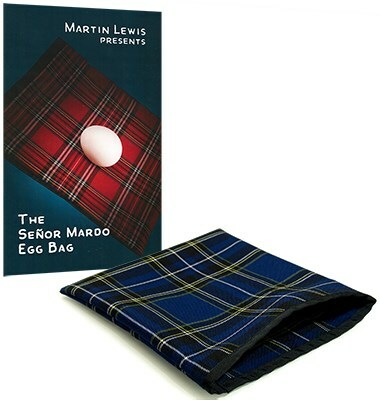 "Nowadays it seems that the egg bag of choice is the Malini Style. I offer my variation of the Senor Mardo bag in my lecture as an alternative. My reasons for preferring this style bag are threefold. It is easier to handle, the (you know what) is invisible even upon direct inspection, and far more effects are possible, as well as some novel moves. I also prefer the brighter coloring. Our Expert seamstress makes these bags and I believe them to be the most practical and deceptive egg bag available." Available in Black or Blue. Dimensions: 8" x 9"